Technique: No Churn Ice Cream (Cranberry Sauce) | Cooking is Fun … Really!! I’ve posted this recipe/technique of making ice cream, without an ice cream maker, before. However, I thought I’d give it another look before the holidays, when an easy make-ahead dessert might be just what you want. Especially if you have some leftover cranberry sauce. You may even want to make some cranberry sauce just so you can make this. All you need is whipping cream, sweetened condensed milk (though you CAN use sweetened cream of coconut as well), alcohol (about 1 tbsp per batch) and flavourings. And at least six hours in the freezer. ** If using an extract with an alcohol base, like vanilla extract or limoncello, as I have in the past, one tablespoon of the extract is all you need. 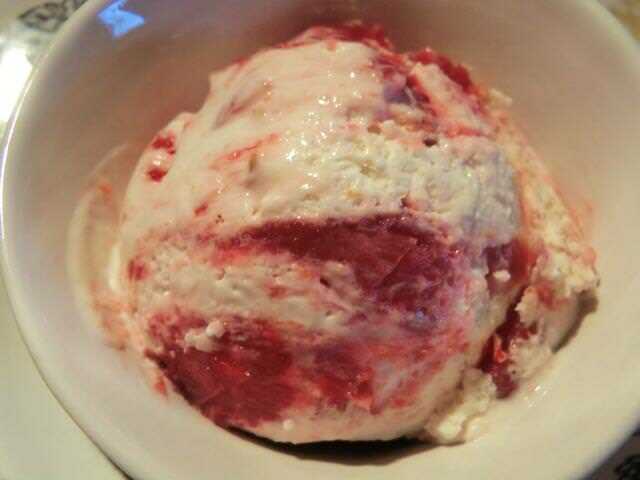 Cranberry Sauce No Churn Ice Cream Ingredients – 3/4 cups whipping cream, 1/2 cup sweetened condensed milk, 1 tbsp brandy, 1/2 cup home made cranberry sauce, plus another 1/4 cup cranberry sauce to swirl through the ice cream. Replicate your favourite chocolate bar (ie Thin Mints, Cadbury creme egg), cookie (ie Samoas, Oreos) or other dessert (ie tiramisu, apple pie) in ice cream form, like the Ferrero Rocher chocolates I made a while ago. Share a link to a picture on your own site. I love this! 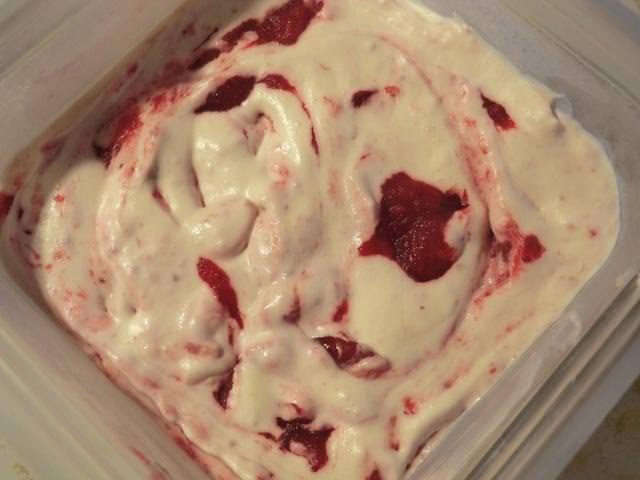 Cranberry ice cream for the holidays (especially no-churn) is a winner in my book! This is very informative! Now I wish I had cranberry sauce, lol!! PS: I bought a jar of mincemeat so I’m thinking of making a small batch for Christmas. Oh, that sounds like pure genius!! But the idea of the crushed pineapple with white rum and grated coconut sounded nice and tropical as the cold winter approaches. And, making the smaller amounts of ice cream (3-4 cups max), which fit perfectly in my rubbermaid containers, means that I can have a bunch of different flavours stacked up in the freezer. That’s why I scaled down the ‘basic’ no churn which calls for 2 cups of whipping cream and 1 (14 oz in the US) can of sweetened condensed milk. Plus the fact that to make the recipe, I would have had to buy 2 cans, since, in Canada our cans are 10 oz. It was so annoying to have that partial can of sweetened condensed milk rattling around in the fridge. It would usually go bad and then I had to toss it. Wasteful. This way, I can make 2 different flavours by dividing the condensed milk evenly into 2 bowls and flavouring each one differently. Sorry to hear about the break in. I couldn’t do without my freezers.